This is one tough, sturdy shrub. One year I'll trim it down to a woody little lump, an embarrassingly ugly look which I'll try and ignore for the next few months. By next summer, if I've timed my passionate pruning correctly, I'll have a refreshed shrub, big and beautiful, covered in daisy flowers, blooming magnificently in the heat of mid-summer. These shrubs are said to be 'useful' for dry, sunny positions, which makes them sound boring. Far from it - the yellow daisies always co-incide with the start of the Great Summer Holiday Break, and the foliage is geometrically interesting, a clean grey-green with white edging. 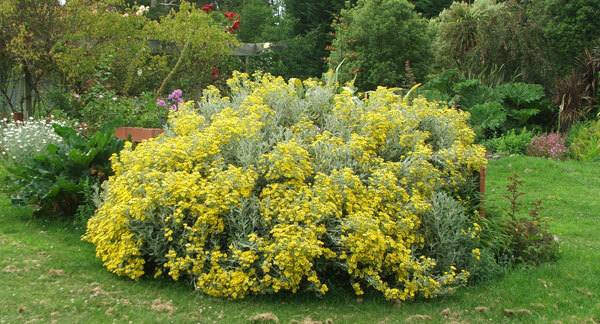 Senecio is an evergreen shrub, though 'evergrey' might be a better adjective. It's a brilliant plant subject when arty photographs of frost are required in winter! 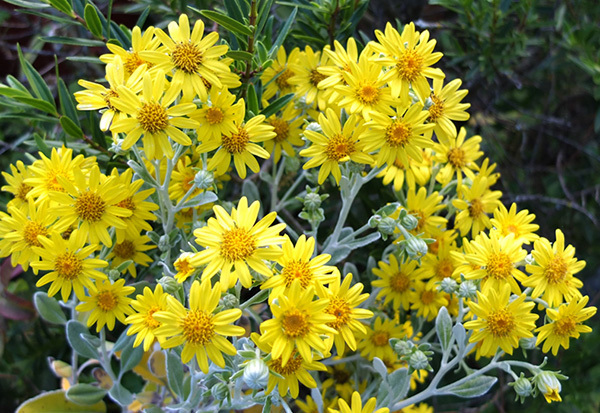 The name may have changed to Brachyglottis greyi, but the yellow daisy bush I know as Senecio gets my vote for cheerfulness and easiness. It's simply no trouble - the perfect plant visitor. 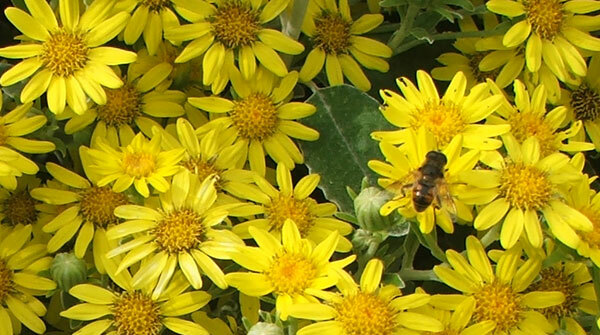 Next time you find a Senecio abandoned in the bargain bin or sale table at the plant nursery - pounce!